To support companies and teams that want to encourage feedback, we have enhanced our feedback feature. HR managers can specify and Manage topics for their organisation’s feedback. For example, let’s say your company has a quarterly cycle for feedback conversations between managers and their direct reports, you can now specify a topic title for this initiative. Also, since you defined the topic, you can track the progress of that initiative by filtering for the topic in All feedback. 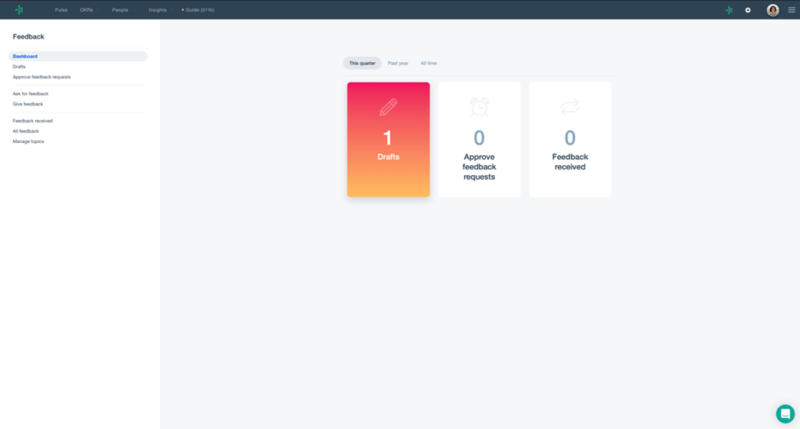 Everyone in your organization now has a feedback dashboard. 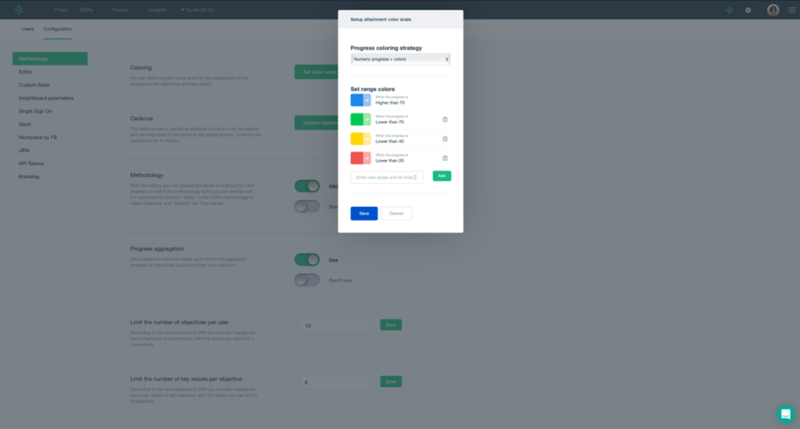 Here you’ll be able to access any feedback you need to complete and is in draft, approve feedback requests, and see the feedback you’ve received. We know it takes time to give good quality feedback. In case you want to start drafting feedback for your colleague and would like to think about it some more, you have an option to save your feedback as draft so you can come back to it later to complete. We now include the context around each piece of feedback. 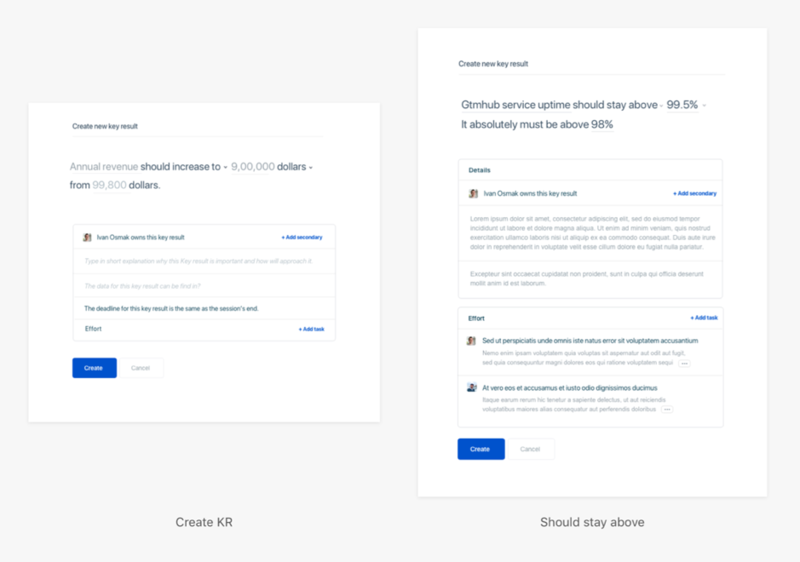 To make it easier for individuals and teams to scan their progress on their OKRs, we provide a way for each company to choose their progress coloring strategy. Let’s say you want progress that is higher than 70 to be in blue, lower than 70 in green, lower than 40 in yellow, and lower than 20 in red—this color coding will appear wherever those progress conditions are met so you can quickly see how your team is doing at a glance. At the core, Gtmhub is all about enabling companies to focus, align, engage, promote transparency, and stay accountable to commitments. We have received feedback to include a Key Result where a target should stay above or below some threshold value. For example, you might have a Service-Level Agreement (SLA) where you have a contractual obligation to maintain a certain level of uptime. We will enable our users to set these types of Key Results. We’ve noticed people (ourselves included) would like to include additional information when updating Key Results. It’s helpful to have a bit of context so we’re providing our users with a way to include notes during a Key Result update. See what we did there? We are creating a Hub for you! We want all our users to know what they need to do next. Need to update your Key Result? We’ll have it in your Hub. We’ll keep all the items you need to address in one place so you don’t have hunt for it. We’ll do the work for you.